My love for Pesto seems to know no bounds! I feel like it is this super secret trick I have up my sleeve that ups the fancy-ness factor of any dish in an instant. Homemade pesto is not only both quick and easy to make, but with the amount that we go through each month, it is also much cheaper to make your own than have shop bought jars. I feel like it is an absolute god-send for those times when I open the fridge and have absolutely zero inspiration. All you need is a plain piece of chicken, white fish or salmon – a shmear of some pesto, bake in the oven and bam! An impressive dinner with absolutely minimal effort required. It also takes some roasted veggies up a notch, as well as making a great dip for raw crudités. I’ve started majorly branching out on the types of pastas my kids eat too, as there are some great products on the market now. Pairing pesto sauce with a chickpea or lentil pasta is very deceptively nutritious; yet a super quick dinner option for us all. Whilst I make a new batch religiously once a month (I simply freeze individual portions in ice cube trays so that I always have some to hand), I try to change up the ingredients each time for a bit of nutritional variety. My basic pesto recipe is so darn tasty, takes a mere five minutes to prepare, yet we reap the benefits for weeks to come. This months version comes packed with spinach, cavalo nero, pumpkin seeds and cashew nuts. But if the sound of the hidden green veggies puts you off, then rest assured it has been taste tested by two of the harshest little critics, and they promise me that they can’t taste the green leafy vegetables in the slightest. · In a blender, whizz the garlic, nuts and seeds together to form a paste — you may need to add a little of the oil to help the blades to puree the mixture. · Add the lemon zest, lemon juice, apple cider vinegar and half of the oil and whizz again. 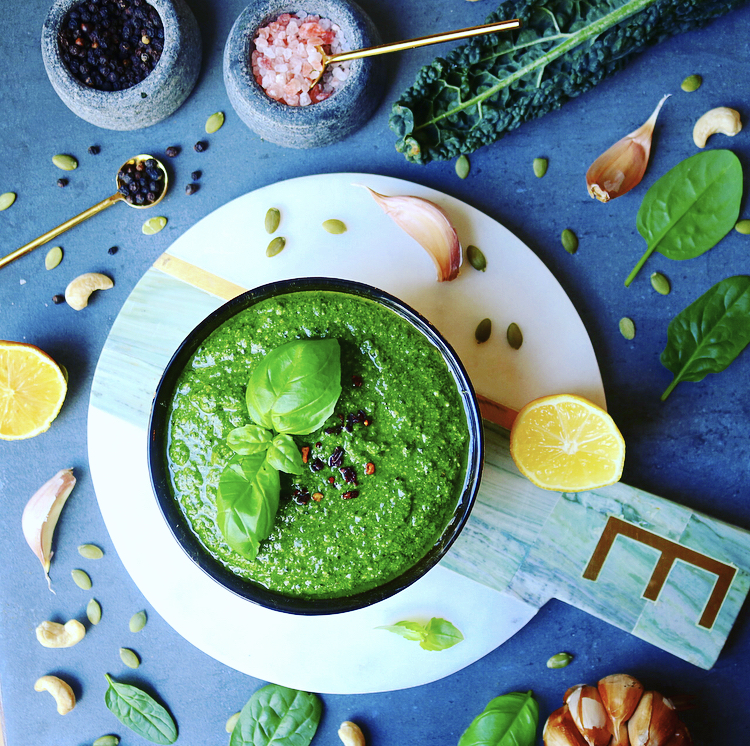 · Only then add the basil leaves (and green leafy veggies if using) — this way, the pesto keeps it’s lovely green colour and doesn’t go brown like it does if you add the leaves at the beginning. · Finely grate the cheese and add it to the blender, then gradually pour in the remaining oil. It might need thinning with a little water or more oil if desired.